Perhaps the lunacy-inducing full hockey-puck moon dangling over the city like a tempting, provocative but out-of-reach piñata was to blame for the Vancouver Stanley Cup 2011 riot. Or perhaps it was some rampant, childish belief that a Canucks jersey, like a Harry Potter invisibility cloak, could conceal what the posturing arsonist posers nonetheless wanted to reveal. Out of Sight, Out of Their Minds? Really? How would you know? Just because the rejected applicant doesn’t return twenty minutes later in a clown suit, armed with an Uzi or a lemon meringue pie doesn’t mean that he or she has coped well with the bad news you had to break. He or she may break well after and far from where you break the news and their hearts. After all, the night’s mayhem and madness wasn’t unleashed until after the wild-eyed perps had left the arena and the sports bars. So, how can you be sure that you haven’t lit a fuse when you snuff an applicant’s hopes? “Out of your sight” doesn’t mean not “out of their minds”. Let’s see whether a point-by-point comparison of a typical job applicant and a typical hockey rioter offers any reassurances that you are right, that job applicants are too sensible to go nuts. Of course, in the absence of any opportunity for you or me to interview the testoster(mor)onic fools who burned, looted, trashed, stomped and smashed their way through Vancouver’s city-center streets, some speculation on their motives and fuses will, at least as a preliminary, be necessary, yet worth it, for the purpose of comparison and insight. The thwarted expectation and rage of the job applicant, like that of the enraged hockey fans and others, will in fact not reflect any real, tangible, material or other losses. The loss should be entirely in as well as of their minds. This means that losing the job opportunity will not mean starving kids at home, a mortgage default and loss of a home, or a forfeited chance to have a kidney transplant, for want of the lost income—just as losing the Stanley Cup means, in terms of real-world consequences, not much more than losing the cup. This is an important point of analogy, for if you are dealing with someone who indeed will suffer the financial constraints and imperatives of the kinds just listed, that rejected applicant will be far more likely to go, and then use something ballistic. What is being explored here is the mind of the less obviously explosive applicant—someone, who, like a hockey fan, will not suffer some obviously unendurable material or social loss, despite whatever emotional insult and injury may be claimed. Upon losing the career chance you held out, the applicant will, after leaving your office, seek revenge upon the host or sponsor of his or her perceived humiliation, just as the gorillas who smashed corporate, downtown windows avenged their “loss” upon Vancouver and core corporations of the kind that sponsored the broadcasts, provided the big free (eventually smashed) viewing screens, party venues and promotions, and that hosted the hockey debacle—indeed, even upon other Canucks fans, with whom they brawled, as soldiers sometimes do with each other under conditions of extreme combat stress. So, in your case, who is the “host”?—you, or your (client) company? It’s a short list. The applicant will feel he or she is somehow a hero, a celebrity, even a martyr, or at least likely to make new friends at Youtube and Facebook (perhaps now, more aptly, “Losingfacebook”). That is to say, somehow the applicant will not only avenge the loss, but gain incomprehensibly precious peer respect for doing so. At least, that is what the demeanor and circumstances of the hockey-exploiting rioting and looting dunces suggests. Call it the “15 minutes of flame” syndrome. To paraphrase the military strategist Carl von Clausewitz, who said that “war is the continuation of politics by other means”, the vanities of rioting are the continuation of Facebook and Youtube vanities by other means. Another instance in which celebrity and fame-at-any-cost trump community, at the cost of sanity, as though the fact of fame (however fleeting and twisted) always matter more than the reason for it. A similar illogic could manifest itself in the aftermath of an interview gone bad.If the analogy with hockey anger holds, a comparably peeved and motivated rejected, emotionally heavily-invested candidate is likely, as a minimum, to exact revenge through Youtube or Facebook. If this shoe through the window fits, and you have any suspicion that there may be revenge exacted, check these two websites in the days that follow the rejection. You may be able to have the trashing blocked on grounds of “violation of use”. The applicant will retaliate in an imitative way—manifesting some of the behaviors associated with success in the job, much as hockey fans who run amuck imitate the raw violence of the players they idolize, especially when breaking the rules and jaws goes unpunished, as it often does on the ice. In practical terms, revenge might resemble a parody of the practice of the game of “business at its best”, on analogy with hockey at its “best” e.g., by very aggressive “anti-marketing” directed at the perceived victimizer, perhaps in a form as simple as “flogging-by-blogging”, i.e., trashing your company in an online blog. The applicant may “project” his perceived loss of worth through humiliation onto an innocent, indeed, absurd and ironic target, much as the humiliated and angry fans project such feelings of worthlessness onto the property they destroy, its guardians or its owners—to the extent that they don’t loot and steal it. In the context of your job, this could be as mild as simple verbal trashing of the job, the (client) company or you personally as “worthless”, or at least useless. The applicant will become angry, rather than helplessly/hopelessly sad or depressed. Inasmuch as sadness and depression are not on-ice manly mid-game options for the team getting clobbered, they are not options for the hockeyed-up fanatics who so ridiculously identify with them. By a process of identification and elimination, that leaves rage as the macho response of choice. To the extent that the career choice of the frustrated applicant is one that involves staying “pumped”, e.g., some kinds of very high-pressure sales and a “when-the-going-gets-tough-the-tough-get-going”, “don’t get sad, get mad” attitude, a response analogous to that of the hyper-aggressive war-painted hockey fanatic would not be entirely surprising. Like the enraged hockey fan, the rejected applicant may have a seething grudge fueled by a bitter sense of the injustice and “unfairness” of it all. To cite an extreme example, research reveals that mass murderers almost always believe they have been victims of some horrible injustice that they feel compelled to avenge. Hockey rioters are likely to include those who have a milder form of perceived-injustice fed outrage, which, of course, allows them to rationalize anything they do. If you sense that the decision not to hire may be perceived by the applicant as unjust, you may have to allow for a strong emotional response, even if it is not a lemon meringue pie in the eye. The applicant may be a “poor sport”, in virtue of believing that “it doesn’t matter whether you win or lose, just as long as you don’t lose.” Whenever the extreme binary “won or zero” mentality prevails, things can get ugly—in the office, as well as in the streets. Spooky though these analogies may seem, they are worrisome only to the degree that there are not some serious disanalogies. So, what, if any, are there? First, unlike hockey fans, job applicants are unlikely in the extreme to use marijuana or other drugs, or imbibe alcohol just before and certainly not during an interview—unless it’s for a job in the movie or entertainment industry. That’s important to note, since like the flammable fluids also brought to the scene, these substances served as accelerants in some incidents during the rioting. Second, the applicants you see are far less likely to have such toxic insecurity-related respect issues. Being accomplished both professionally and personally, they are very unlikely to desperately seek, indeed, demand, respect that they have not been able to earn from and in their accustomed and more civil society—a far likelier motive among the perps. However, this possibility cannot be completely disregarded, since several of the now self-confessed rioters and looters were awash in respect in virtue of being, in one instance, a star provincial water-polo champion and a university scholarship designee (an award now likely to be withdrawn, even if criminal charges are not laid). Third, your applicants will, in general, see themselves as having too much to lose by weirding out and breaking windows, jaws and laws. Then again, several of those identified or self-confessed as looters, car burners, etc., had much to lose and lost it, ironically including one environmental conservation major, who, with many others, may some day have to do some awkward explaining of the on-the-scene photos, videos, news reports, if not any eventual criminal charges, in the event she or they are ever invited to job interviews after graduation. 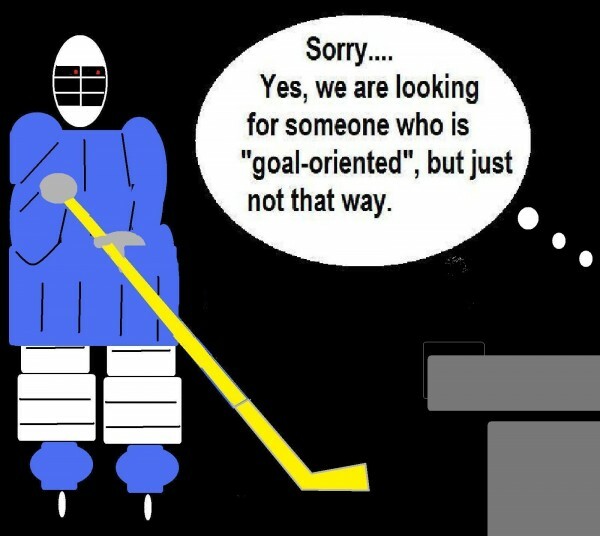 Fourth, in your interviewing and screening phases, there are no provocative “supernormal stimulus” levels or suspended social norms, e.g., face painting, screaming and other behavioral extremes of the kind encouraged by hockey, but which do not become norms or risk factors in interviews. Fifth, your applicants, unlike hockey rioters, can neither be encouraged by nor hide in a crowd immediately after you break the bad news. Their interviews are one-on-one with you. Primitive tribalism, so important to those with otherwise shaky identities, is unlikely to play a role in your office or later, unless the applicant brings other Bloods or Crips to the interview or afterward. Sixth, an applicant in your office is not likely to psychologically be in tribal mode, and therefore not susceptible to mob psychology. That’s because above all he or she is attempting to win some distinction as a unique stand-alone candidate. Seventh, if an applicant loses a shot at a job, his entire peer group does not collectively suffer as well, since they will not have identified with his winning the way an angry hockey fan and his like-minded friends will. Eighth, it is unlikely in the extreme that an applicant will behave deviantly just for the alleged kinds of kicks and thrills cited as reasons for rioting and looting. That’s because virtually all job applicants are more interested in getting hired than high. Hence, unless an applicant is likely to lose his home and family, appears to be high, seems to have serious respect issues, displays exaggerated behaviors or adornments and/or brings dodgy friends who wait outside, you will probably have little reason to suspect there may be trouble. Chances are that, if you ever unexpectedly have to face a lemon meringue pie, it will end up on your desk, not on you. …And then only as a thank-you.